A keylogger is a type of surveillance software (considered to be either software or spyware) that has the capability to record every keystroke you make to a log file, usually encrypted. 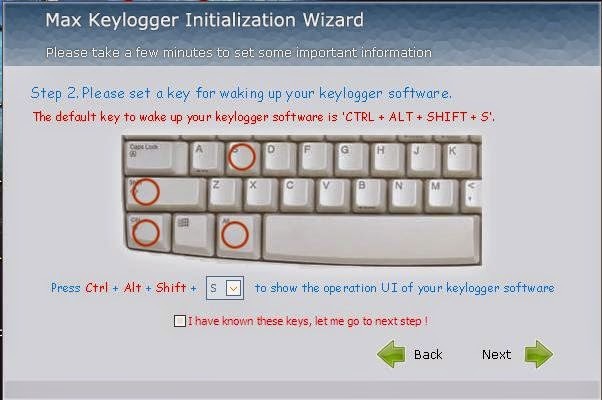 A keylogger recorder can record instant messages, e-mail, and any information you type at any time using your keyboard. The log file created by the keylogger can then be sent to a specified receiver. Some keylogger programs will also record any e-mail addresses you use and Web site URLsyou visit.Keyloggers, as a surveillance tool, are often used by employers to ensure employees use work computers for business purposes only. Unfortunately, keyloggers can also be embedded in spyware allowing your information to be transmitted to an unknown third party. Max keylogger is an all in one keystroke logger & monitoring Software. it is a complete PC surveillance software package, designed to keep track of all keystrokes. In addition to its primary key capture function it performs as a full-fledged computer monitoring Software: This unique software allows remote computer monitoring and keylogger recording in real time such as logs any password and makes screenshots, tracks Internet sessions etc. Max Keylogger allows you to record and monitor every activity happens on your computer and have it delivered to your email! Automatically stealthily(Secretly) record every IM chat, monitor every website visited and control it all so easily. No other PC monitor software gives you the security of knowing you’ll be able to collect every screenshot and every keystroke with just the click of a button. Every keystroke from popular chat, online email and social sites is recorded. Including Myspace, Facebook, Twitter,ICQ, Yahoo Messenger, MSN Messenger, AIM,Skype and any more other programs. Max keylogger is easy to operate due to its intuitive interface. All things are clear to an end-user. Invisibility is not only one feature, but also keylogging event remains are usually undetected. Max Keylogger solution is the best choice for those do not want to struggle with PC configuration issues and required comprehensive monitoring reports. The Max Keylogger Software is Perfect to: To System administrators: Max Keylogger could help you clearly know about what have been displayed in the system. protect yourself know everything they do on your computer. The computers in your company are under your fully control with Max Keylogger. You will clear about all your employees’ performances or actions anyone using your official computer. Max Keylogger protect your business. To Parents: You could follow up all programs your children have run. And find out what they have search on the Internet. protect your children form online dangers. To All Users: Be able to build a full control on your own PC with Max Keylogger. Besides you will be clear about what was run and when, what text was typed, etc. on your PC in your absence. Using the program constantly, you will able to restore the previously typed text in case you have lost it. With the help of Max Keylogger, you also could restore the forgotten password or the lost email. To Computer Classes and Internet Cafes: Max Keylogger will let you know what the users have been doing on the computers. Covert operation of Maxkeylogger :the one monitored cannot detect it. method of startup with hot keys Ctrl + Alt + U (hot keys can be defined by yourself) allows you monitor the computer you want to monitor comprehensively without a trace. operation of computer: monitor keyboard input, on screen display, windows opened and idle time of computer; strong control function: prohibited from opening the window and software specified by you. Pure software architecture: no requirement or influence on computer and network. User privacy protection: we keep all customers buying our products strictly confidential. Carefree after-sale service: we have professional technicians who can provide professional, comprehensive and considerate after-sale service for customers. Version feature: monitor native operation. Range of application: monitor and manage computer usage behavior. Network requirement: realize native monitoring without network transmission. You can check monitoring records on native computer or send the monitoring information to your specified email and check them on other computers. Easy, customizable and expert-level set-up.